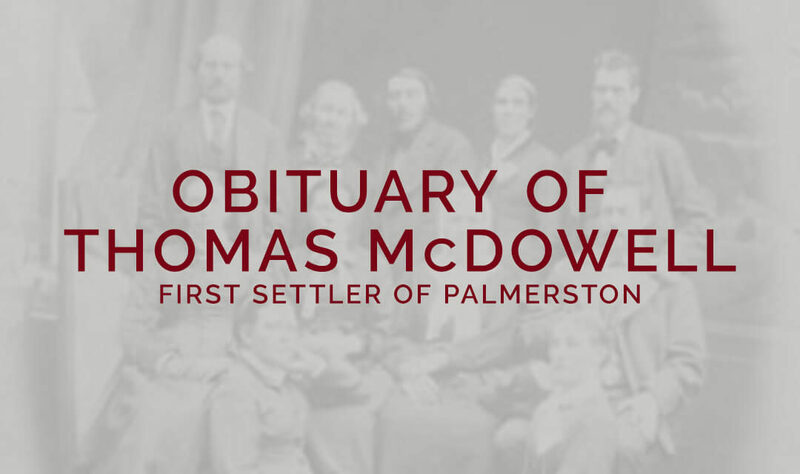 A Palmerston pioneer in the person of Thomas McDowell passed away at the residence of his son-in-law, Mr. Wm. Frost, of Hamilton, on Friday, May 7th, 1909, in his 86th year, after a short illness from the ravages of old age and the general breaking down of the system. The remains were conveyed to Palmerston, the funeral taking place to St. Paul’s Church on Monday, May 10th, thence to the Palmerston cemetery. The deceased has had a remarkable career. He was the first resident of the town as well as its first mayor, which position he held for six years. Mr. McDowell has made his home with his daughter, Mrs. C.W. Frost, for the past few years, and up to the last retained a wonderfully bright intellect. When a young lad some 14 years of age he came to this country with his parents, and the family first settled in Tecumseh, Simcoe County, where his boyhood days were spent. In 1852 he moved to lot 18, con. 11, Wallace, together with his wife, who predeceased him several years ago. The first year Mr. McDowell lived in Palmerston he put in a very enjoyable season hunting partridge and fishing for trout. He built the first log cabin in Palmerston and three months later other settlers began to arrive. Upon the advent of the railway a town site was surveyed by Lewis Bolton, P. L. S., of Listowel, assisted by one of the railway engineers. Mr. McDowell guided the destinies of this town for many yeas and may properly be termed the “Father of Palmerston”. He was a useful, conscientious citizen, whose memory is honoured by the entire town. One by one the brave and sturdy pioneers who hewed out homes in the wilderness and made it blossom as the rose, are passing away – they nearly all sleep beneath the sod. All honour to them. These brave and intrepid men by their early privations and vicissitudes and industry and perseverance laid the foundation of our national greatness, for few countries have made such pronounced advances as Canada. The early pioneers might well be proud of their work, for under the flag of Britain, which is the emblem of power, grandeur and civilization, they subdued the wilderness and brought to light the arts of civilization. Under these historic conditions the the remains of our first pioneer citizen were tenderly and and reverently laid to rest by the citizens of Palmerston, to await the glad resurrection morning, when this mortal shall put on immortality and death is swallowed up in victory. Out of respect for the memory of the deceased, all the business places in the town were closed during the funeral hour, and the Town Council and officials marched in a body to the Palmerston cemetery, where the remains of the first mayor and citizen were interred. Mr. McDowell was the first member of Blair Lodge, A. F. & A. M., who in common with others, paid a tribute to the memory of the founder of Palmerston. We extend our sympathies to Mr. and Mrs. Frost of Hamilton who so lovingly cared for the deceased for the last few years of his life and during his illness. The funeral obsequies were conducted by the Rev. Dr. Smith, pastor of St. Paul`s Church, who highly eulogized the work and character of the deceased, for he was a man of sterling integrity and an example to all with whom he came into contact. Honoured and loved, he expired at a wonderful age, after a life full of usefulness both to the community and his fellow men.